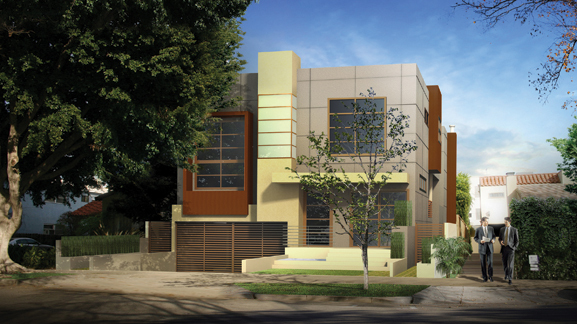 Not all duplexes in West Hollywood attract spillover crowds at their open houses. The exceptions are the units on Westbourne Avenue developed by Monte Stettin and designed by Bruno Bondanelli, which to tend draw people from all over the city. Their second and most recent effort at 714 Westbourne is a case study in the way to insert green housing in the tightly packed neighborhoods of this dense little city, where housing is sought-after and land for development is almost non-existent. Nearing completion, 714 is also an essay in the elegance that the builder can achieve when the commitment to sustainability is married to a love of materials. The New York-born developer, Monte Stettin, and the Verona, Italy-born architect, Bruno Bondanelli, together emphasize simplicity and spaciousness in the three-story units. Bondanelli, for his part, says the new units are an improvement over the earlier units; he prefers the durable, cementitious panels that cover the exterior. Also to his liking is an extra-large master bedroom, which includes an open loft space, like a small mezzanine, that overlooks the master, which can serve as a home office or perhaps a small studio. “The room looks much more spacious,” says the architect approvingly. Stettin, the developer, is a restless, creative personality who has pursued careers as a fashion photographer, director of commercials and feature-film scenarist before taking on sustainable housing. Always seeking new challenges, Stettin has set his mind on an even tougher project: creating low-income housing that is both green and aesthetically appealing.